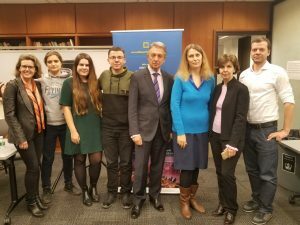 The Ukrainian Studies Program at the Harriman Institute, Columbia University hosted a panel discussion on the reintegration of Donbas. On 18 January 2018, the Ukrainian parliament adopted the law on the peculiarities of state policies in the temporarily occupied territories in Donetsk oblast and Luhansk oblast. The presidential decree of 7 February 2019 included a list of towns and villages that fall into this category. Since then, most policy discussions revolved around political and diplomatic means for the return of the territories. In contrast, the panel focused on the human factor in current debates about the reintegration of the temporarily occupied territories into Ukraine. The panelists included Pavlo Ostrovskyi, Ukrainian journalist and activist of the “Strong Communities” movement; Taras Galkovskyi, computer scientist at Google and leader of the MathOlymp project at Razom; Elise Giuliano, Lecturer in Political Science and Director of the MA program at the Harriman Institute.This event was co-sponsored by RAZOM and the VOLYA Institute for Contemporary Law and Society. Following the introductory remarks by Mark Andryczyk, Associate Research Scholar in the Ukrainian Studies Program at Columbia University, Yuriy Sergeyev, Senior Fellow at the MacMillan Center, Yale University and former Ambassador to Greece and Albania (1997-2000), France and to UNESCO (2003-2007), and the United Nations (2007-2016) outlined a wide range of issues that are critical to the reintegration of the population in eastern Ukraine. The panel discussion was moderated by Olena Nikolayenko, Associate Professor of Political Science at Fordham University and a board member of the Shevchenko Scientific Society in the United States. The panelists emphasized the importance of cross-oblast contacts in facilitating a dialogue among all Ukrainians. Ostrovskyi, for example, recalled the popularity of the civic initiative From East to West, bringing students from eastern and southern Ukraine for a week-end to Lviv. Drawing upon her research in the city of Kharkiv, Giuliano discussed how internally displaced persons (IDPs) and those who stayed in the rebel-controlled territories are seen in Ukraine. Another factor that the panelists mentioned was economic development in contemporary Ukraine and in particular the persistence of corruption. To date, Ukrainian oligarchs exercise a great deal of clout over eastern Ukraine and inhibit positive economic growth in the war-torn region. Nonetheless, some IDPs start new small businesses in the Ukraine-controlled territories. For example, the bakery Prianivil, specializing in gingerbread, has become a popular destination for residents of Druzhkivka in Donetsk oblast. In concluding remarks, the panelists concurred that it would take many years to fully re-integrate the local population.